TAMMY’S NOTE: This No-Sugar challenge documents Ashley’s 30-day attempt to remove PROCESSED SUGAR from their diet. This challenge allows her to use natural sugars such as fruit, honey or true maple syrup, therefore it’s not meant for a diabetic alternative, simply a personal-health challenge. Anyway, our guest-poster Ashley recently shared with us her four-week journey of a diet with NO refined sugar at all! This no-sugar version of chocolate no-bake cookies was shared on her FINAL WEEK’s update. 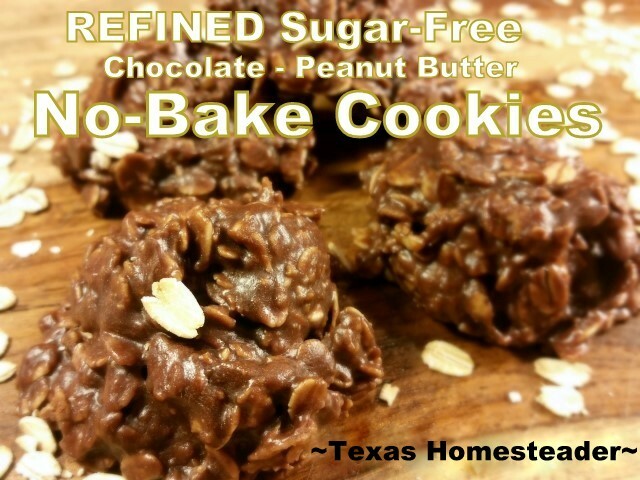 What a great sugar-free spin on a favorite recipe! And since it’s no-bake there’s the added bonus of not heating up the house on a hot summer’s day. You’re gonna want to make these SOON! from Ashley : One of the things that has kept me sane through the month of switching my diet so drastically is finding desserts that were free of refined sugar. One of my favorite childhood memories was my mother filling a cake plate with No-Bake Chocolate cookies. This recipe has it all! No oven time heating up the house during the summertime and CHOCOLATE. It’s so quick and easy that it can cure the strongest craving in no time at all! Ok, are you guys ready for this? You combine all of your ingredients until evenly mixed and spoon the mixture onto wax paper or a cookie sheet. I used a 2-tablespoon cookie scoop for mine - so worth it if you don’t have one already! If your coconut oil is solid, you may need to heat it up just enough to make it liquid, but that’s it! You’re done! Since the coconut oil melts at room temperature, you need to store these in the refrigerator. Trust me, it’s worth it. 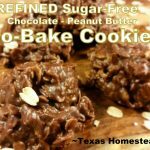 This entry was posted in Blog Posts and tagged Cooking, Frugality, Make-It-Yourself, Recipes on May 8, 2016 by Texas Homesteader. This may be picky, but this recipe is not “sugar free”. A diabetic would have a problem with this recipe because honey and maple syrup are both sugars. Although there is no white granulated sugar in this recipe, there is definitely still sugar in it. I found the title to be misleading, myself. Love your blog. You have a great format with lovely photographs. Thanks for your timely, kind reply. I need to try this.Looks incredible. Thank you for linking up with us at #HomeMattersParty. We would love to have you again next week. I love these cookies! I prefer all maple syrup because I’m not a huge fan of the taste of honey. YUM! Thanks for sharing at Simply Natural Saturday! My recipe is a bit different but the outcome is the same………….Delicious. Only trouble is; I can’t just stop at eating one. Thanks for the recipe as I will be making this version after getting back from the grocery store later today.